I am a carer for a person with PCA. I have no particular web site skills, so only occasionally make changes to this website. And I am now too busy to search the web, as I used to, and keep up with developments. 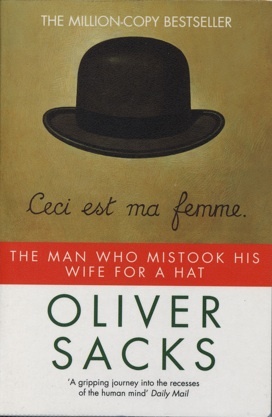 The title of the book ‘The Man Who Mistook His Wife For A Hat’ may be familiar to you. The book describes 24 unusual cases neurologist Dr. Oliver Sacks encountered whilst in practice in New York. The title of the book comes from the first case, that of Dr P. The book was first published in 1985. Dr P., a musician and music teacher, and his wife attended a consultation with Dr Sacks, after a referral from an ophthalmologist. During an examination of Dr P., Dr Sacks came across some ‘strange mistakes’, or odd behaviours by Dr P. Then, on leaving the consultation Dr P. looked around for the hat he had come in wearing. He reached out for what he thought was his hat but took hold of his wife’s head, and tried to lift it off to put it on. He had mistaken his wife for his hat. After a subsequent meeting, Dr Sacks concluded Dr P. was suffering from visual agnosia. What the cause of Dr P’s agnosia was, or how his symptoms developed is not known as Dr Sacks never saw the gentleman again. Visual agnosia is a significant symptom of Benson’s Syndrome, or Posterior Cortical Atrophy. The PCA syndrome was first described as a syndrome in 1988 by Dr Franck Benson. If you read the case of Dr P. I am sure the seasoned PCA carer will recognise some of the events that happen during Dr P’s consultation. Reading the introduction to section ‘Losses’ and the 20 or so pages about Dr P. are recommended. So, all the while we were trying to get a meaningful diagnosis, the answer, or a route to the answer, was sitting on the shelf in my local library.